Fall is here and that means a lot of things, including fall foods. For many people, it also means pumpkin spice! 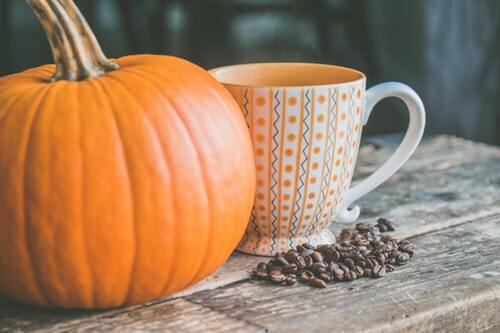 However, while pumpkin itself has several health benefits, that doesn’t mean you should start chugging pumpkin spice lattes without considering the health implications. Depending on where you get your drink from, and how you have it made, there could be a lot of calories in it – and a lot of sugar. This doesn’t mean you’ll need to avoid delicious pumpkin spice drinks and foods this fall. It’s certainly still possible to enjoy these fall flavours when you’re craving them. Here are some tips to make doing so healthier. Before you drink a pumpkin spice coffee or eat a pumpkin spice treat, take a look at the nutritional information. As mentioned, many of these treats contain quite a lot of sugar and other added ingredients that aren’t great for your health. By reading labels, you’ll be able to make a healthier choice for yourself. There are many health benefits to eating pumpkin. It’s rich in fibre and it contains a lot of vitamin A and a good amount of vitamin C. However, many “pumpkin spice” treats contain very little (if any) pumpkin at all. Some of them get all of their “pumpkin spice” flavour from artificial flavouring. To make sure you’re getting the health benefits of pumpkin, you’ll need to check the ingredients to see if there’s any real pumpkin in your treat. There’s nothing wrong with occasionally treating yourself and ordering a pumpkin spice latte from your favourite coffee place. However, when you do, try to stick to a small. You’ll still get the taste you’re craving, but you won’t be consuming all of the calories. Also, stick with just the drink. If you order a pastry to go with it, you’ll be consuming A LOT of calories and sugar. If you do order a pumpkin spice drink, stick with the drink. Adding on whip cream or sprinkles or any other “toppings” will increase the calorie count and almost certainly lead to you consuming more sugar. Try to stay away from these additions when you can.